Ironic as it sounds, one of the reasons why a Jaguar looks special on Indian roads is because you don’t see them very often. That may not be a good enough reason for the Brit marquee but it’s good for its latest-for-India, the XE, as it is able to capture attention despite the fact that it’s designed more to carry forward the legacy of Jaguar’s family sedan’s and less to make you lust after it. While the XE is the smallest Jaguar sedan, in terms of appeal, it manages to upstage its elder sibling, the XF. Sure it’s not as elegant as the biggest XJ, but this one does look fresh from the oven. A prominent, single frame mesh grille houses the growling Jaguar face with headlamps that look inspired from the feline world. In profile, the sporty lineage becomes more apparent – a large hood with the cabin pushed as far back as possible, and short rear overhangs manages to give it a purposeful look. At the rear, trademark rear haunches are the most striking design aspect and manage to hint at the performance intentions of this car. Jaguar engineers will tell you how each and every line, crease and fold on the outer skin has aided in making the car aerodynamically more efficient. Inside, the XE carries forward the less flashy, more elegance bit. The seats are plush and come in varied levels of leather and finishes depending on the trim you choose. Ergonomics are generally up there with the best, but we would love a more interesting-looking centre console. A more evolved European market may not warrant it, but we are sure most Indians would have loved a bit more expensive-looking stuff on the inside. Even the digital displays in the instrument cluster and centre console look a bit old-school. The only gimmick inside is the way the gearknob aka ‘Jaguar handshake’ emerges from the central tunnel. Yes, when you put the car in ‘race’ mode, the instrument display gets a red hue but we would have expected more imagination. Under the hood, the XE gets a 2.0-litre turbo petrol. It’s the same unit that does duty in Jag’s bigger sedans, which means it feels much peppier in this smaller, lighter car. Jaguar is offering the engine in two levels of tune. So, you can either choose a 197bhp/320Nm spec that manages to propel the car from 0-100kph in a claimed 7.7seconds or a 237bhp/340Nm that we tested to a 0-100 time of 7.6s. It may not look much, but Jaguar claims the latter to be 6.8s, probably attributing our slower time to inferior fuel quality and some launch issues on this test car. But the time isn’t what we would be fretting about much because the XE manages to sprint in a manner befitting a fast, powerful car. Exhaust note isn’t of much… note… but the car propels with the same urgency of a certain Usain Bolt on a race track. Power goes to the rear wheels via an eight-speed automatic with noticeable throws. For those used to seamless power of German cars, this Jaguar likes to do this a bit differently. Shifts are more noticeable and the power a bit peaky as if the car is sensing every movement of your foot on the throttle pedal. No, you can’t leave the XE to itself. It likes to get continuous driver inputs, be it the steering or the accelerator. The XE gets electric power steering, which actually weighs up as speed builds. The wheel is good to grip (especially in the higher portfolio trim) but maybe, a tad oversized. Being all-new, the XE gets a lot of tech under the skin. For example, it’s monocoque chassis is aluminium intensive. Even the body uses over 70 per cent of this good stuff. As a result the XE is significantly lighter and feels quite agile. On the downside, any body damage would be an expensive affair. 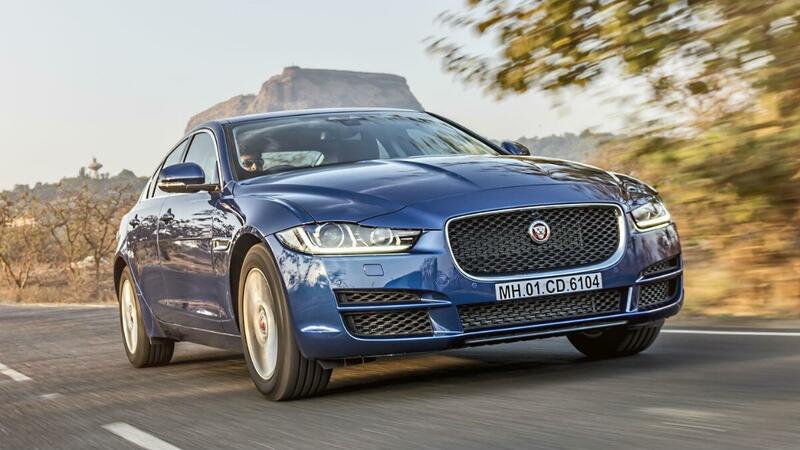 The XE may be a global car but Jaguar, once again, gets the ride quality all sorted for Indian conditions. The rear suspension uses an integral link layout, which seems to work better than a multi-link one as it offers better longitudinal and lateral stiffness. And you will notice this even at low speed rides, which is a bane on many high-end cars tuned in developed countries. What also helps are the high profile tyres, which may not necessarily look nice, but helps sort the ride on bad roads. The XE qualifies well as a highway mile-muncher, which is no surprise, but it also manages the twisties well. The nicely weighing-up-steering, the lack of significant body roll or feeling of heft, and a relentless supply of power makes it an ideal partner on a hill road. Grip levels stay high and the car shows no tendency to understeer, which is what we would expect from a marquee with extra-ordinary sporty heritage. Despite its small dimensions and a not-too-flattering rear seat, it does manage to give a big car feel when on the move. In the higher-power-spec version, it feels the part of a quick, powerful luxury car. The cabin may appear spartan compared to say, a C-Class, but is one of the quietest that we have experienced in a long time. And while it maybe the less pretty one from its stable, the XE is a true representative of the Leaping Cat’s ability to bring a smile to the face behind the steering wheel. It’s less C-class and more 3-series, to give you an example and come to think of it, a bit more exclusive than both. Ironic, but true. Smallest of the Jaguar sedan’s but every bit a driver’s car.